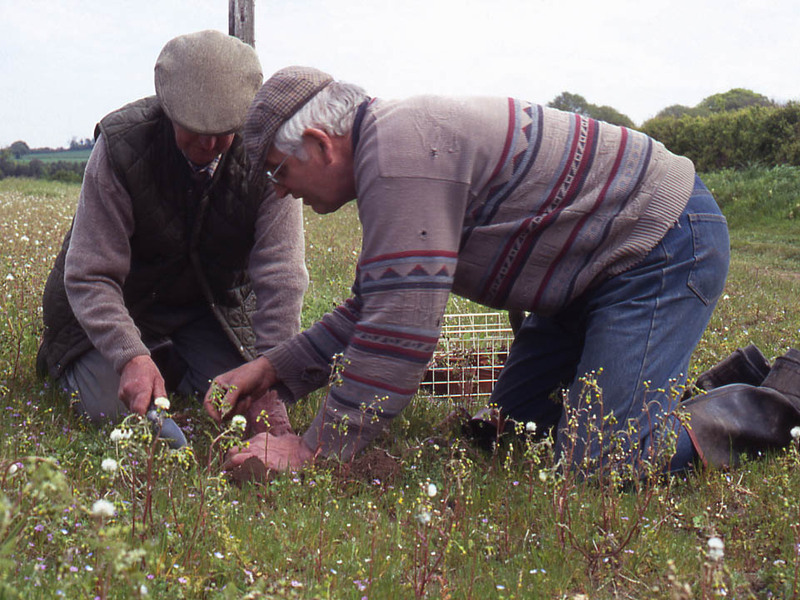 I recently read a fascinating paper exploring how farmers gain personal benefits to their wellbeing, from taking part in projects which help wildlife on farms – in this case a project to help conserve rare cornfield wildflowers in North Yorkshire. I contacted the author Heidi Saxby, and this is a blog she has written on her research. This article was first published on Sociology Lens. Examining ﬂowers in North Yorkshire Cornfield Flowers Project (CFP) margin. Image courtesy of CFP. Do farmers derive any personal benefit and well-being from their Agricultural Environmental Schemes (AES) work? Being a volunteer grower and seed guardian for North Yorkshire’s Cornfield Flowers Project (CFP) made me aware of how this project functioned differently from other, mainstream AES. The CFP capitalises upon farmers’ personal interest in arable flowers  Participating farmers are not paid for the work, do not sign contracts, and are not obliged to adhere to prescriptive cultivations methods imposed by an external agency. Unlike most AES, the project is also restricted to a relatively small geographical area of North East England. Research shows that most AES are considered by farmers to be bureaucratic, time consuming and onerous. They are organised so that they can be applied generically across the whole country and prioritise process over outcome. Central administration is easier, but farmers cannot easily modify the schemes to local conditions such as land type and weather patterns. Farmers’ own skills, motivations and interests are not optimised, and AES work can become a chore rather than a satisfaction. For my dissertation for a Food and Rural Development Research MSc in Newcastle University’s Centre for Rural Economy, CFP became my case study. I found that this drew my attention to social processes within the project which I had largely overlooked within my role as a volunteer. These included the ways that alliances were formed amongst farmers because of their interest and expertise in arable flowers, differentiating them from other, local arable farmers with no interest in or even a disdain for what they saw as weeds. CFP farmers’ social networks provide opportunities to consult, advise and receive advice about cultivating arable flowers, share seed and plant material otherwise difficult to obtain, and indulge in competitive banter about growing the most extensive range of, or the best examples of flowers. On a local and individual level this appears to contribute to their sense of belonging and identity, but it also performs a practical function in that the farmers have become a unique community of expertise now sought out by agricultural and environmental professionals wanting to know how to manage arable land for biodiversity. The farmers relish this role reversal; outsider experts seek their advice instead of telling them how to manage an AES. Garden growing CFP plants for seed production and saving. Photo by Heidi Saxby. My own volunteer status and capital within the project benefited me whilst I was planning and doing my research fieldwork. Being a seed guardian may have reassured farmers of my genuine interest in the project and their work, so that they were sanguine about the time my visits took up and receptive to my endless questions. And perhaps my (limited) knowledge of arable flowers gave me a head start when discussing propagation methods. The farmers took great pride in showing me around their farms, carefully diarising my visit according to the forecasted weather and crop maturity, in order that I would enjoy a ‘good show’ of flowers. When visiting their flowering field margins I was especially struck by farmers’ pride in ‘their’ flowers, and the meanings they attributed to them. One farmer speculated about his grandfather seeing these beautiful weeds when ploughing with horses; slow work giving farmers closer proximity to arable flowers than is afforded by modern farming methods and mused about his current conservation efforts enhancing the chances of his grandson and potential great grandchildren seeing them on the same land in the future. For this farmer, as for others, the arable flowers represented permeance, place attachment and his family’s history on that land, with the flowers elevated to a status more complex and personal than that of being ‘just’ a pretty weed. Each flower had a story associating it with its particular farm or farmer’s family. Abundant Cornflowers create a blue haze on the headlands of one farm, yet refuse to grow on another nearby CFP farm. Gowland Lane, near to a different CFP farm bears the local name for Corn Marigold, indicating it once grew profusely there. Venus’s-Looking Glass thrives on yet another farm at the extreme north of its geographical range. All the Corn Buttercups now flourishing on CFP farms were originally propagated from the tattered, post-harvest remains of one solitary plant located by chance. Such stories and the manner of their telling suggest that the farmers become emotionally invested in the flowers and the process of caring for them, and demonstrate the flowers’ symbolic and well as their material value. Farmers spent considerable time hunting for, ‘good examples’ of elusive, especially rare or beautiful flowers to show to me, with some visiting their flowering margins shortly before my planned visit to stake out particular plants for my appraisal. I spent hours walking around field margins where farmers grow their flowers, listening to their gleeful stories about other CFP farmers and photographed the flowers that they carefully displayed. I was shown to places regarded with especial affection because of their flora, fauna and tranquillity, and heard explanations about the meanings these things had for them. It would be intrusive to relate those here, but they illustrate how farmers’ efforts to look after the natural environment brought satisfaction, and motivated ongoing CFP (and AES more generally) work. Blue-flowered form of the Scarlet Pimpernel. Photo by Heidi Saxby. Saxby, H., Gkartzios, M. and Scott, K. (2017) ‘‘Farming on the edge’: Wellbeing and participation in agri-environmental schemes’, Sociologia Ruralis.